Stockholm, Sweden is generally considered one of the most expensive cities in Europe. However, after my 48-hour budget weekend there, I can confirm that it’s not only possible to have a cheap weekend in Stockholm, it’s actually pretty simple and still allows for so much fun! Let’s start at the beginning: Friday morning around 3:15 a.m., when my alarm went off so I could catch an airport express bus with my boyfriend Dylan (£9 each way) to the London Stansted airport. With our backpacks in tow and our pre-printed boarding passes at the ready, we made it through every Ryanair fine-printed rule and onto the plane. After arriving at the Stockholm Skavsta airport (which is where all Stockholm Ryanair flights arrive), I downloaded the ‘Flygbussarna’ app and bought tickets for the bus from Skavsta to the Stockholm central station (about £15 each way). Frankly, it’s a miracle I remember all this since I slept deeply through both bus rides and the flight. Thankfully, that meant I was ready to explore and begin the 48-hour adventure when we came to a halt in the Stockholm Centralterminalen around noon. Our Airbnb was a 20-minute walk away: 20-minutes of soaking up the sunshine and crisp air, giddily taking in the views. Bright yellow, orange, and red buildings and arched bridges over the icy Lake Mälaren greeted us, surprising me with the casual beauty around each corner. We stayed in an Airbnb in the Kungsholmen neighborhood, which is a more residential part of Stockholm. This made staying on budget much simpler: besides being affordable to rent, it also meant that we were near cafes and grocery stores with cheaper prices than those in touristy areas. Honestly, after a month in London, it felt downright cheap! I would recommend staying somewhere like this outside the Old Town of Gamla Stan (more on that later). 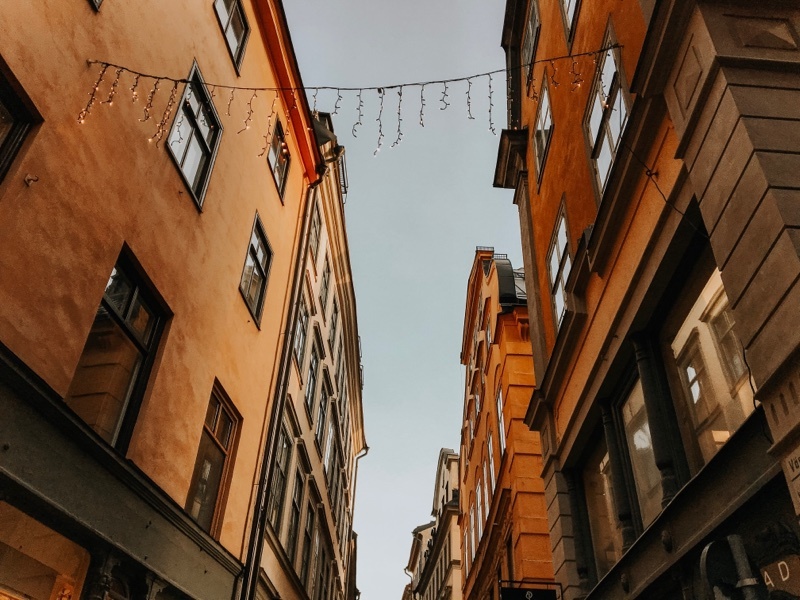 Once we’d dropped our bags at the apartment on Sankt Eriksgatan, we headed out with our cameras to see what Stockholm held in store. Besides the buses to and from the airport, we walked nearly the whole time we were in Stockholm. There is a great public transport system if you’d like to wander farther afield, but for 48-hours on a budget, my own two feet served just fine to get me everywhere I wanted to go. The city is very, very pedestrian friendly. Additionally, electric scooters, called Vois, that can be rented with your phone (just like Birds and Limes in the US) are everywhere in Stockholm, so we had to give them a try just once! They make a great solution in a city that’s already so bicycle friendly. 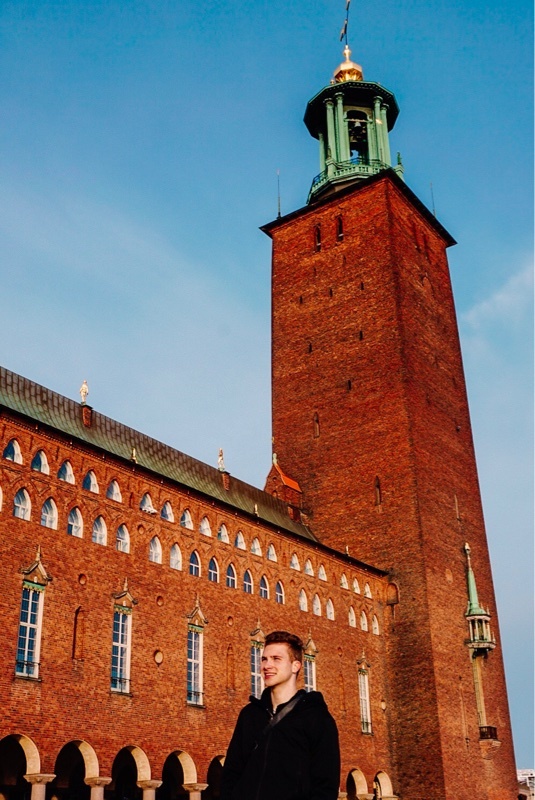 Here are my top takeaways on the must-see and dos for a budget weekend in Stockholm, Sweden! Old City Hall: You can pay to go inside this building, but I didn’t and don’t feel that I missed out. The red brick courtyard and tower are simply gorgeous and extremely recognizable from nearly anywhere in the city. The building is also right on the edge of the water and there is a popular walking path around the perimeter of Kungsholmen. Spend a while walking it with a coffee and you’ll run into approximately a dozen dogs being walked and 20 men pushing baby strollers as well as a stunning view. Gamla Stan: The Old Town of Stockholm is a can’t miss area, even if it is the most well-trodden tourist path. Walk through before mid-morning to avoid large crowds and enjoy the many narrow side streets and bumpy cobblestone streets. That said, don’t spend all your time here! There are beautiful areas like this in other areas of the city that aren’t chock full of cheesy tourist shops and cafés with menus in English. 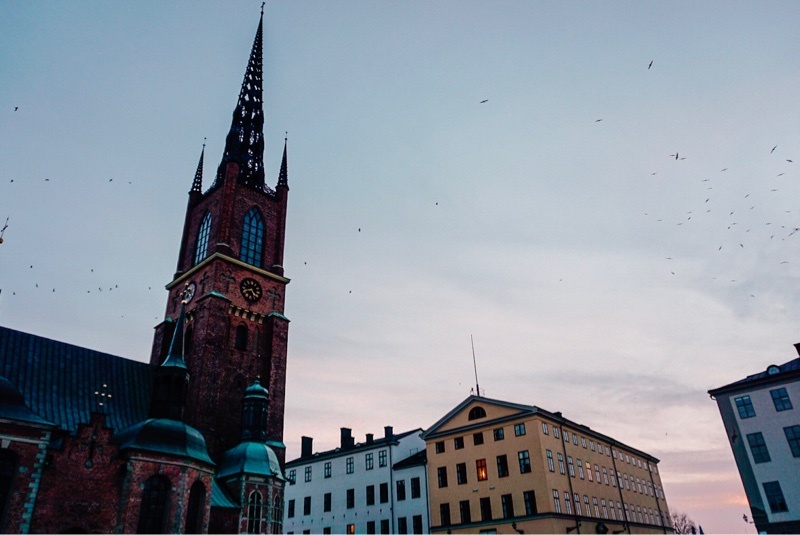 Riddarholm Church: This church’s distinctive black spire can be seen throughout the city, perhaps even more easily than the City Hall’s tower. Up close, the building is even more incredible. It stands in a square surrounded by the city’s classic warm-toned buildings just atop a gentle slope down to the water. I visited here at dusk, as the sun could be seen sinking between neighboring buildings and the blue dusky glow lit up the whole clear sky. Södermalm: North of Gamla Stan, you’ll find this trendy and eclectic neighborhood. It’s known for cool shopping and the social vibe of Nytorget Square has lots of interesting restaurants and coffee shops. 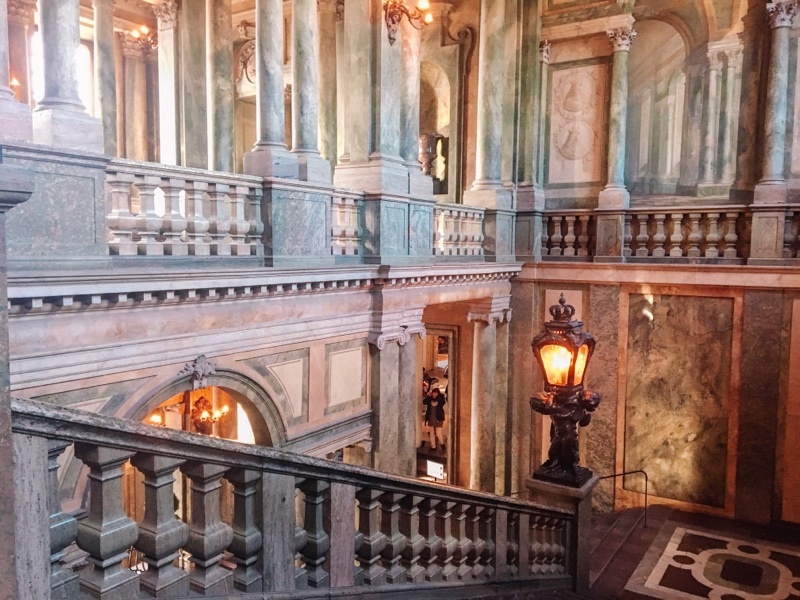 Nationalmuseum (free): Unlike London, most museums have an entry fee in Stockholm. But not Nationalmuseum! 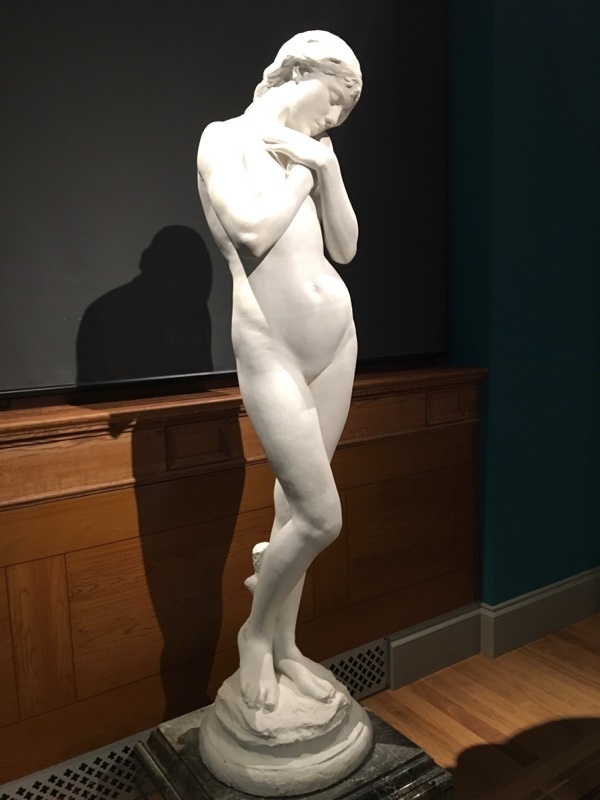 It just reopened last year after extensive remodeling and has a very diverse and interesting collection of artworks both historical and contemporary. Something else I noticed here? 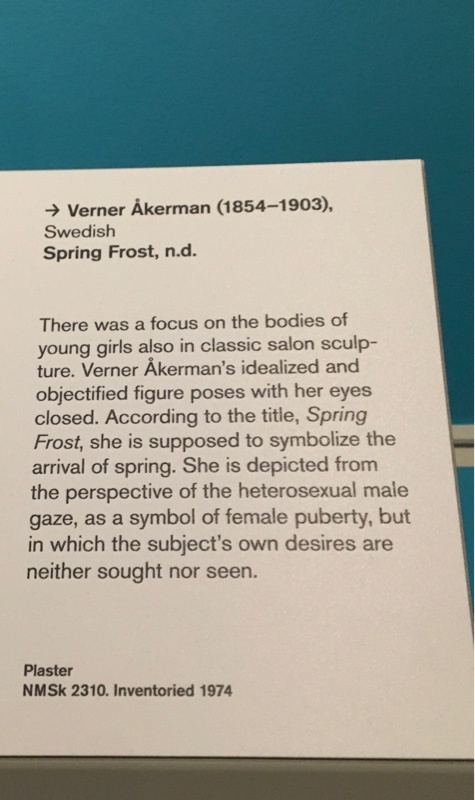 Swedish art captions are more feminist than you could believe. Reading them and getting the sort of insight I never have from the more detached captions in the US and UK was one of my favorite parts of this visit. Royal Palace (adult $16/student $8, guided tour $3) and Royal Armory/Carriages (free): You could be forgiven for not realizing that this palace is a palace at all- its spare, rectangular Baroque styling and noticeable lack of Disney castle turrets and towers create an aesthetic much different from what you might imagine! But don’t be fooled- the inside of this (still frequently used) royal residence is opulent, unique, and full of stories. Pay for the guided tour- it’s more than worth it, and after it ends you can spend as much time wandering the palace as you like. This palace actually burned down in 1697; it was formerly known as Tre Kronor and much more fairytale-esque, but today’s style was already planned before the fire destroyed the remainder of the original building. However, underground portions of the building survived, and the archaeological sites can be visited on the same ticket used for the rest of the palace. Give it a look and you can see several artifacts from medieval Sweden displayed right where they were discovered. Lastly, the Royal Armory is free to enter with or without a ticket to the Royal Palace. It’s currently an exhibit of Royal Carriages- which are still worth seeing- dating back to the 1600s while the Armory is under construction. 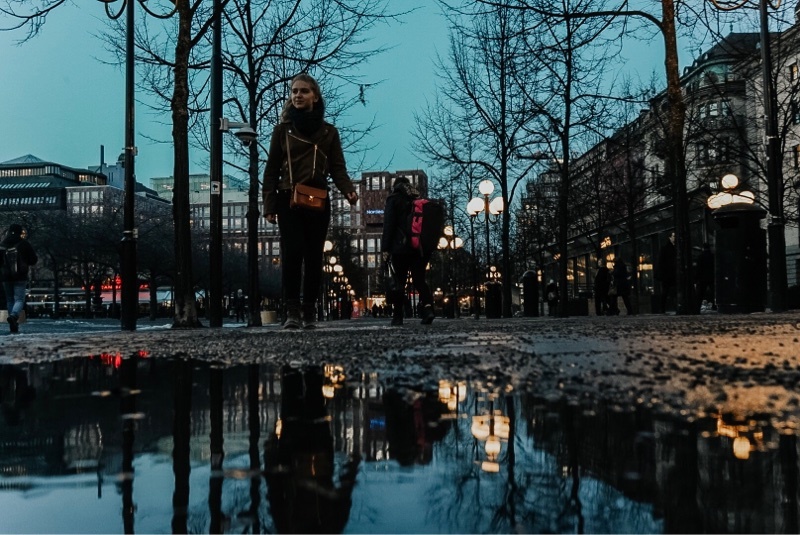 Fotagrafiska ($17 adult/$14 student): This contemporary photography gallery is located in the Sodermalm neighborhood and since Dylan is so into photography, we knew we had to give it a visit! I was pleasantly surprised that I ended up completely loving it – especially the Kirsty Mitchell “Wonderland” exhibit. The whole lower level of the gallery was filled with her utterly gorgeous, fantastical fairy-tale influenced photographs, representative of a journey through grief after losing her English teacher mother. It was immersive and really unlike any experience I’ve had in an art gallery before. Ice Rink at Kungsträdgården: As we slowly wandered on our way to Nationalmuseum, we saw tent-shaped Christmas lights in the distance and decided to check it out. We found a festively lit-up ice rink in the middle of a park and I regret not skating on it so much. 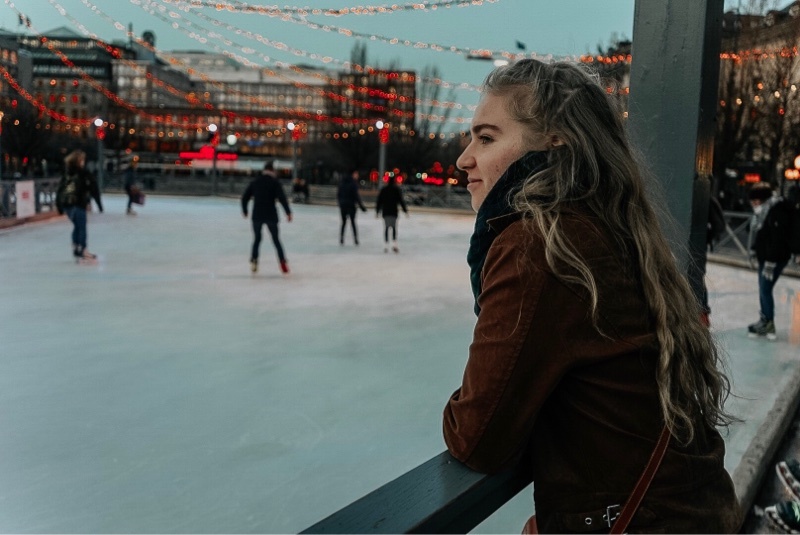 We still hung around to enjoy watching the skaters for a bit and the atmosphere was lovely. If you get the chance, do better than me. Skate. Fika: This is my favorite takeaway from this weekend in Sweden. Fika is the non-translatable word for taking a break for coffee and pastry with friends. Swedes have some of the best (dark, rich, often bottomless) coffee I have ever had, and their fika culture is powerful. The average Swede drinks around 3-4 cups of coffee daily, one of the highest numbers in the world. Try a semla for your pastry – the almond paste and whipped cream filled cardamom buns are something of a Swedish specialty, most common in the early springtime. Cinnamon buns and cardamom buns (kardemummabullar) are also quite popular, and I recommend trying cardamom buns as they’re fairly unique. If you need something extra sweet, go for a drömrulltårta, aka the original Swiss Roll. 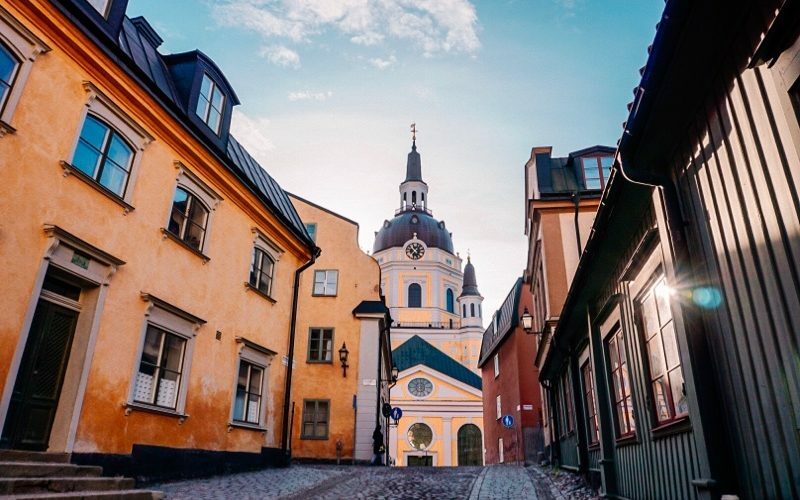 As you explore the city, make time for fika to rest, recharge, and pace yourself while experiencing a bit of Swedish culture. 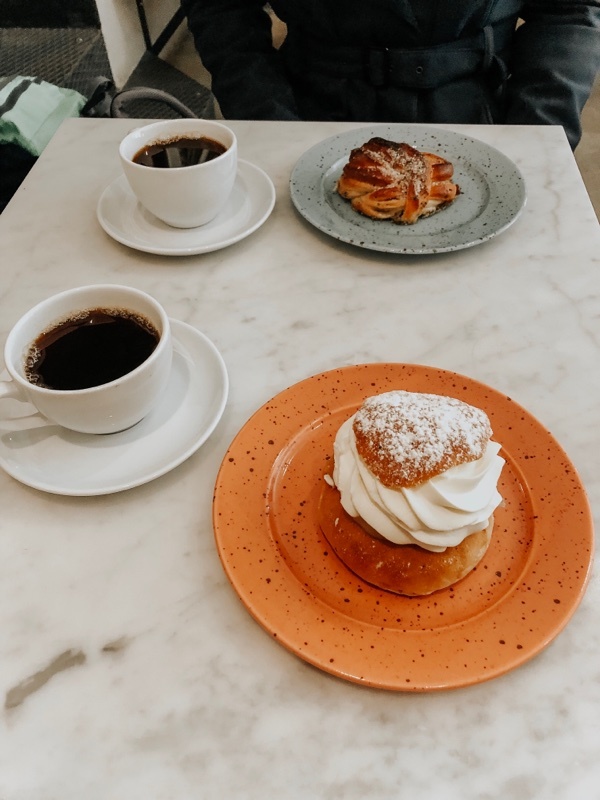 A few favorite places we fika’d (and yes, it is both a noun and verb) are “Grain” and “Bulleboden Bageriet” in Kungsholmen and “Fikabaren” in Södermalm. For dietary restrictions, “Vete-Katten” in Norrmalm (the city center, near the ice rink) has options- unfortunately they were closed on Sunday, so I didn’t get a chance to check it out myself! One way we saved money on this trip was to buy groceries for breakfast and dinner and only pay for a fika at lunchtime every day. I have NO regrets about this approach! Speak a little Swedish: Every Swede I met spoke perfect, unaccented English. Despite that, walking into a café and not even knowing how to say that I didn’t speak Swedish (besides my reflexively dropped jaw at the rapid-fire unintelligible language that greeted me) made me feel like a bit of a jerk. So just download Duolingo and have fun trying out a few phrases! And it’s just that simple. 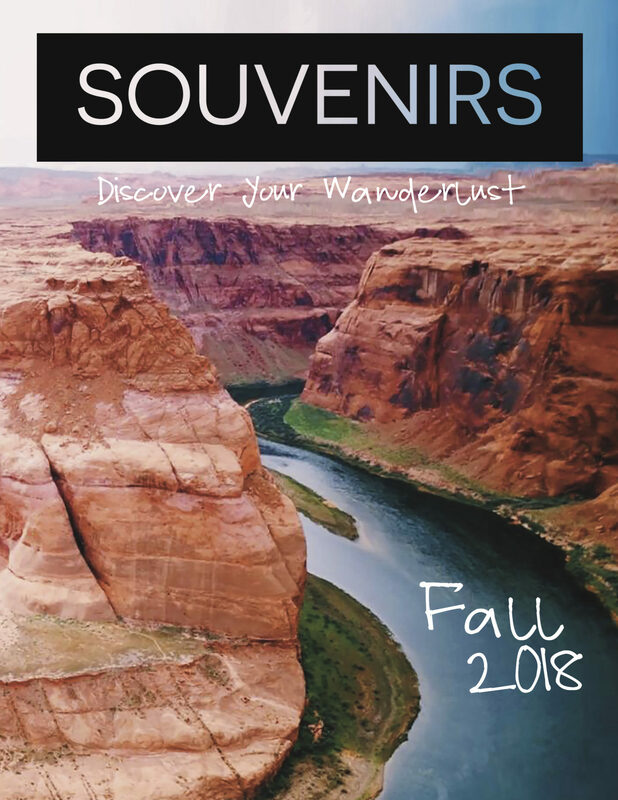 I hope this was helpful in showing how incredible Stockholm is as well as that it can absolutely be accessible and enjoyable even for broke study abroad students!